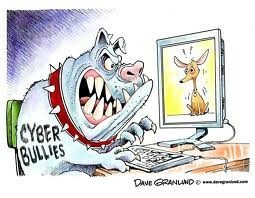 Cyber bulling is mean don't do it. Sometimes people feel like their getting physical hurt. Don't listen what they say blocked them from you. You might get mad and depressed but don't say mean stuff back. People who cyber bully might be depressed,sad, Jealous of you or all of them.If you are being cyber bullied tell a trusted adult (teacher or parent) they will help you deal with it. Some states cyber bulling is illegal it should be all states. Just don't go on that website or blocked them ignore don't say anything back be the better person. I got information at www.parentfurther.com/,www.internetsafety101.org/, www.kidpower.org/, and www.stopcyberbullying.org. 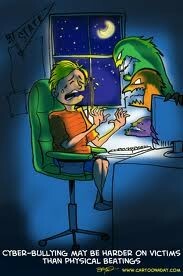 I Know alot about cyber bullying been in a situatoin and watched some movies about cyber bullying. 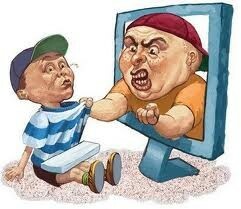 Movie titles: Cyberbully, CyberBullying Prevention, and Awkard Shows sometimes have cyber bullying.